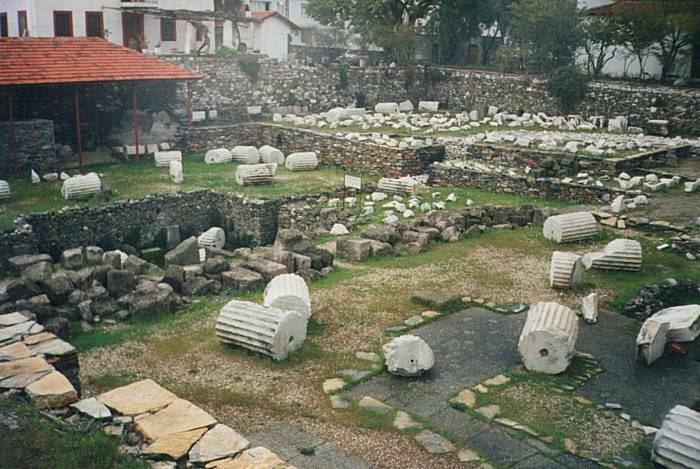 Halicarnassus, today's port of Bodrum in the Turkish Republic, was the site of the one of the Seven Wonders of the Ancient World. Like all of them except the pyramid and Sphinx complex of the Gaza plateau outside Cairo, nothing remains today but ruins. 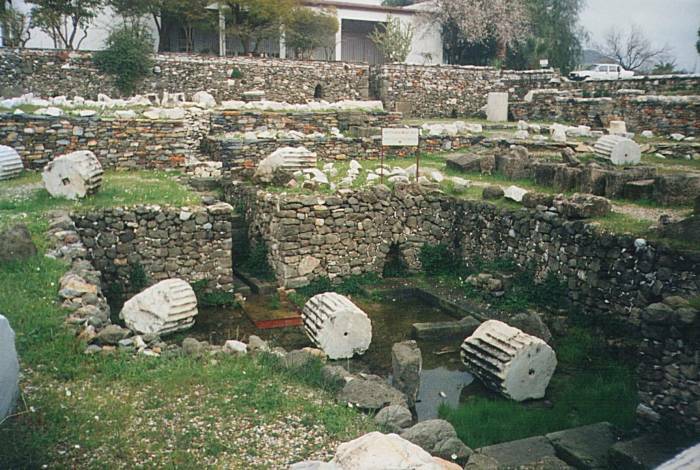 Like most of them, the Mausoleum of Halicarnassus was disassembled to use its stone to build something else. Halicarnassus was originally a Dorian colony of Greece. The figures on its coins suggest that its settlers came from Troezen and Argos in the Peloponnese, in southern Greece near Mycenae. Things were swell and cultured for a while, but then Lygdamis came to power and started killing the poets. The long-winded travel writer and "father of history" Herodotus, a native of Halicarnassus, left in 457 BCE. Map of Turkey showing Bodrum and Halicarnassus. By 400 BC the Dorian cities of Asia were part of Caria, part of the Persian Empire. Hecatomnus was Carian king, or Persian Satrapy, from 404 to 377 BC. He had three sons, Mausolus, Idrieus, and Pixodarus; and two daughters, Artemisia and Ada. The three sons all in turn succeeded their father as ruler. The Carian custom was for rulers to be siblings, keeping power and wealth within the family (along with all the recessive genes), so Mausolus was married to his sister Artemisia, and Idrius to his sister Ada. The family was descended from the local people, whom Herodotus described as being of Minoan origin. But King Mausolus spoke Greek and admired Greek culture and democratic traditions. He founded a number of cities along the Carian coast and directed that they be designed along Greek lines. Mausolus succeeded his father as Carian ruler in 377 BC. He moved the Carian capital from Mylasa to Halicarnassus, on a peninsula facing the island of Kos. The Carian coastline is a jagged one given the rough terrain of the region. The city overlooked the Ceramic Gulf, now known to the Turks as the Kerme Körfezi. Mausolus wanted a capital city that was both spectacular and defendable. He had his workers deepen the city harbor and use the dredged sand to make protecting breakwaters. His ships could then deny access to enemy warships by blocking a small channel. Bodrum is on the south coast of the peninsula, west of Muğla and across a narrow strait from the Greek island of Kos. 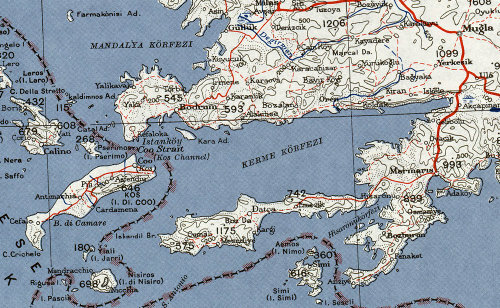 From a U.S. Army map of the Aegean available at the University of Texas' Perry-Castañeda Map Collection. The workers paved streets and squares, beautiful marble temples and public buildings, and houses for the citizenry. Mausolus had a large fortified palace built on one side of the harbor, providing clear views out to sea and inland toward the surrounding hills, watching the possible avenues of enemy attack. Further fortifications inland included defensive city walls and watchtowers. Mausolus died in 353 BC. Artemisia, his wife and sister, succeeded him as ruler. She immediately started construction of a magnificent tomb for Mausolus and herself. It was to stand about 45 meters tall, and its architect and sculptors were the best ones available at the time. 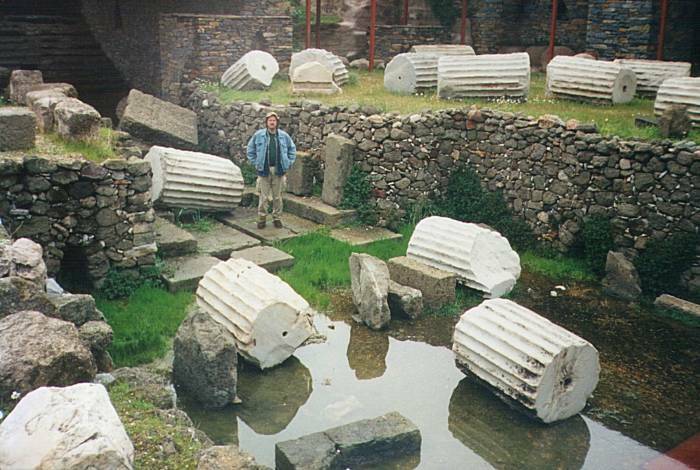 One of them was Scopas, who had supervised the rebuilding of the Temple of Artemis at Ephesus. Mausolus and Artemisia had captured the Aegean island of Rhodes a few years before his death. When the Rhodians learned of Mausolus' death, they organized a fleet and sailed north to capture Halicarnassus. Artemisia learned that they were coming, and hid her warships at the eastern end of the city harbor. The Rhodian forces disembarked to make their attack. Artemisia's fleet appeared out of its hiding place, captured the Rhodian fleet, and towed it out to sea, leaving the Rhodian invaders with no fall-back position. After defeating the Rhodian invaders, Artemis' soldiers sailed to Rhodes in the Rhodian ships. They were taken for the returning victorious Rhodes army and allowed to land with no defense mounted. They easily captured the city of Rhodes and put down its rebellion. Artemisia died just two years after Mausolus, in 351, "of grief" according to the later historian Cicero. She was cremated, as Mausolus had been, and the urns with their ashes placed in the still unfinished tomb. A large number of animals were ritually sacrificed and placed on the stairs leading to the tomb. The stairs were then filled with stones and rubble to seal their tomb. The builders and sculptors continued working on the monumental tomb of Mausolus. According to the later historian Pliny the Elder, they did this "considering that it was at once a memorial of his own fame and of the sculptor's art." In other words, the funding was already in place and this was a great chance to become a famous artist. This may have seemed opportunistic, but it turned out to be correct. The tomb was finished in 350 BC, a year after Artemisia's death. It was situated on a hill above the city, with a dramatic view down over the city and out to sea. The tomb was built on a square plan and was massive. The tomb was built within an enclosed courtyard. The center of this courtyard held a large stone platform. The stairway leading to the top of this platform was lined by stone lions. Stone warriors on horseback were at each corner, guarding the tomb. The tomb rose from that platform, starting with a square block about 15 meters tall and covered with action bas-reliefs showing the Greeks fighting the Amazons and other battle scenes. The next 15 meters of height was columns, ten per side, lining the outside of a square stone block structure. Above that was a pyramidal roof rising another 15 meters, for a total height of about 45 meters. The roof pyramid was topped with a square platform holding a large statue of four horses pulling a chariot holding Mausolus and Artemisia. The structure was so gigantic and elaborate that it was included in the standard list of Seven Wonders of the World compiled by Antipater of Sidon. More good news for Scopas, who now had two Wonders on his resume: the Temple of Artemis at Ephesus and the Tomb of Mausolus. It was known as the Μαυσωλεϊον, or Mausoleum as the Romans called it, because it was the tomb of Mausolus. "Mausoleum" became a generic term for a grand tomb, and more recently for most any above-ground tomb structure. The next brother, Idrieus, took the throne. He died in 344 BC and was succeeded by his sister/wife Ada. Then the third brother, Pixodarus, seized control from his sister Ada. She managed to hold onto the Alinda fortress. Pixodarus was probably cranky because he was the only brother who didn't get a sister to marry. Alexander the Great entered Caria in 334 BC, and Ada surrendered her fortress to him. Alexander seized Halicarnassus, and returned the rule of Caria to Ada. In return, she formally adopted Alexander as her son. This guaranteed that the rule of Caria would pass to Alexander when Ada died. Alexander had laid siege to Halicarnassus, and the Persian leadership (by now a son in law of some of the five children of Hecatomnus, family relationships are complicated in an incestuous satrapy) burned the city as they retreated. Halicarnassus never recovered from the self-inflicted disasters of Alexander's siege. The Roman historian Cicero (106-43 BC) described the site as being almost deserted. Pirates attacked the city in 62 and 58 BC, although the Mausoleum was undamaged. Eustathius, a Greek scholar and Archbishop of Thessalonica, wrote a commentary on the Illiad in the late 1100s. He said the Mausoleum "was and is a wonder." Finally, after standing for about 1,600 years, a series of earthquakes broke the columns and sent the grand statue falling from its top. It was rubble with only the base still recognizable by 1404 AD. The Knights of St John of Malta invaded the region in the early 1400s and built the massive Castle of Saint Peter controlling the harbor. By then the place was known as Bodrum, as it still is today. They used most of the remaining pieces of the tomb for building the castle, you can see sections of polished marble here and there throughout its structure. Many of the best surviving sculpture pieces were moved to the castle. Suleyman the Magnificent captured the Crusader knights' base on Rhodes in 1522. Up until then, the knights had been periodically raiding the dwindling supply of precut stones at the old tomb site to further fortify their castle. The knights withdrew to Malta, and the Ottoman Empire took control of Bodrum and the Castle of Saint Peter. With the Ottoman Empire shrinking, the British gained power in its former territory. A British consul sent several of the statues back to London, where they can be seen today in the British Museum. The British Museum sent the archaeologist Charles Thomas Newton to Bodrum in 1852, charging him with finding remains of the Mausoleum. By this time the exact location was unknown. Newton studied the accounts of Pliny and other ancient writers to estimate its approximate location and size. He bought a small plot of land at what he figured was the most likely location. He dug down, and then tunneled out underneath surrounding properties. He managed to find some walls, a staircase, and finally three of the four foundation corners. That let him buy just those parcels of land covering the ancient site. Among other things he eventually found were the statues of Mausolus and Artemisia that had stood in the bronze chariot on the very apex of the tomb's pyramidal top. Grant's Tomb and 26 Broadway in New York, New York, USA. City Hall in Los Angeles, California, USA. Shrine of Remembrance in Melbourne, Australia. Indiana War Memorial in Indianapolis, Indiana, USA. Soldiers and Sailors Memorial in Pittsburgh, Pennsylvania, USA. Civil Courts Building in Saint Louis, Missouri, USA. The House of the Temple in Washington DC. 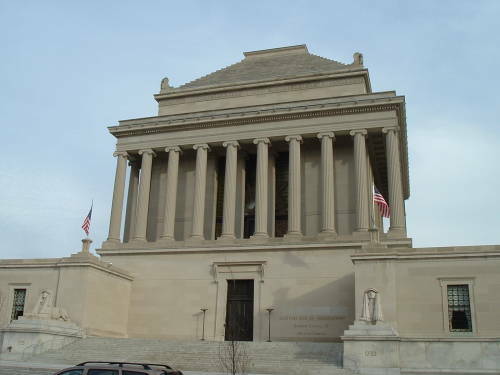 The House of the Temple, a Masonic building in Washington, D.C., USA, built 1911-1915 AD in what was thought to be the design of the tomb of Mausolus. 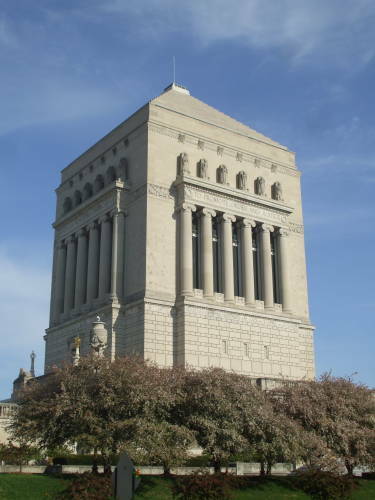 The Indianapolis World War Memorial, in Indiana, USA, built 1926-1933 AD in what was thought to be the design of the tomb of Mausolus. The knights' castle is still there, and it houses the very interesting Museum of Underwater Archaeology. Once archaeologists finally figured out where the Mausoleum had been located, they were able to locate it and do some excavations. There's not much left — just some foundations and some column pieces that the Knights of St John either missed or didn't have any use for. There are just a few sculptural pieces remaining at the site. Bodrum is three hours by bus from Selçuk and Ephesus, and two hours from Marmaris. If you are coming from the area of Denizli and Pamukkale, be careful to check the routing. Large buses follow the main highways and can get there in about three hours. However, some smaller buses follow the smaller twisting roads through the mountains. It's possibly more scenic during the day, but it is a long and twisting ride when it's dark. There are daily ferries to and from both Kos and Rhodes from the first of May through September, with less frequent ones outside the high season.